Jesus told this story: "A man had a fig tree. He planted the tree in his garden. The man came looking for some fruit on the tree, but he found none. The man had a servant that took care of his garden. So the man said to his servant, 'I have been looking for fruit on this tree for three years, but I never find any. Cut it down! Why should it waste the ground?' But the servant answered, 'Master, let the tree have one more year to make fruit. Let me dig up the dirt around it and put on some plant food. Maybe the tree will make fruit next year. If the tree still does not make fruit, then you can cut it down.'" 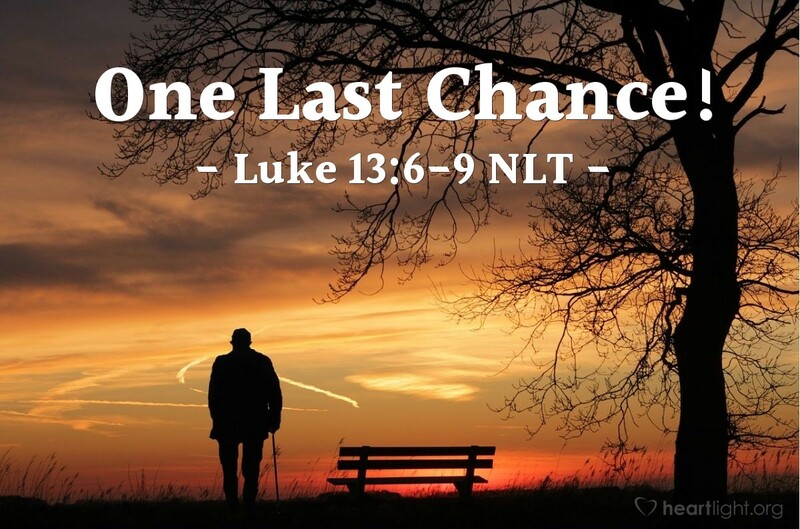 At the end of Luke 12, Jesus reminded his disciples to always be ready and live with a sense of urgency about his return. Jesus began chapter 13 by calling on people to repent. Now Jesus is basically reminding us that we are on borrowed time. We need to repent now. We've been extended a season of grace to become fruitful, so we've got to be fruitful. No more playing around with religion. No more hypocrisy. No more religious talk without spiritual commitment and spiritual living. It's put up or shut up time. It's time to be fruitful. Holy and righteous Father, I know that now is the time you want me to be fruitful. Today you want me to live for you with passion. Help me put off my religious procrastination. Bless me as I seek to lay aside my fears and inhibitions about following you. Empower me to live with holiness, urgency, and a sense of joyous expectation. In Jesus' name. Amen.